Sylvia Shaw Judson is the artist of the iconic sculpture on the cover of the novel Midnight in the Garden of Good and Evil by John Berendt. The disquieting image of the sculpture and the word evil in the title never appealed to me. 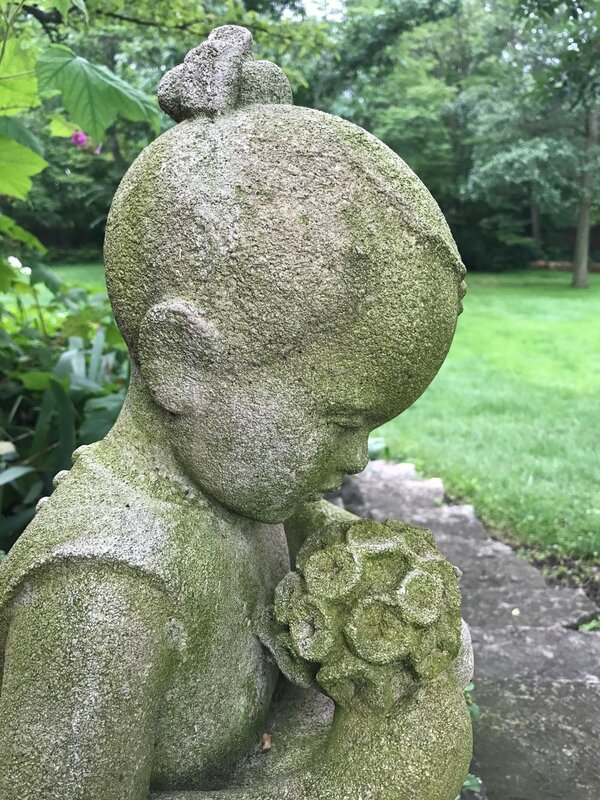 However, this summer, I took a second look at that image when I spent a week among Judson’s other sculptures at Ragdale, her family home in Lake Forest, IL. If you wish to read about that cathartic week, see my previous journal entry. Bird Girl made in 1936 by Sylvia Shaw Judson. Sculpted at Ragdale, her family's summer home in Lake Forest, IL. It’s been a month since my time in the studio named after Judson, “Sylvia’s Studio”. I didn’t fully realize it while there, but now I feel she made a quiet yet powerful impact on me. She is my kindred spirit. Her sculptures were everywhere on the grounds of Ragdale. They were tranquil, strong and peaceful. I loved how she conjured a sense of the divine in ordinary subjects. They had been there for years and years watching all that had come and gone. They didn’t make sounds yet you could feel each piece had a deep, deep story to tell. If only one would stop to listen; rest long enough to absorb their stories. The inspiration, the vision of this one person, Sylvia, who made animals, people, the lines she used, the expression, the addition of flowers to some struck me with authoritative stillness. They were almost breathing as they sat proudly in their spots. 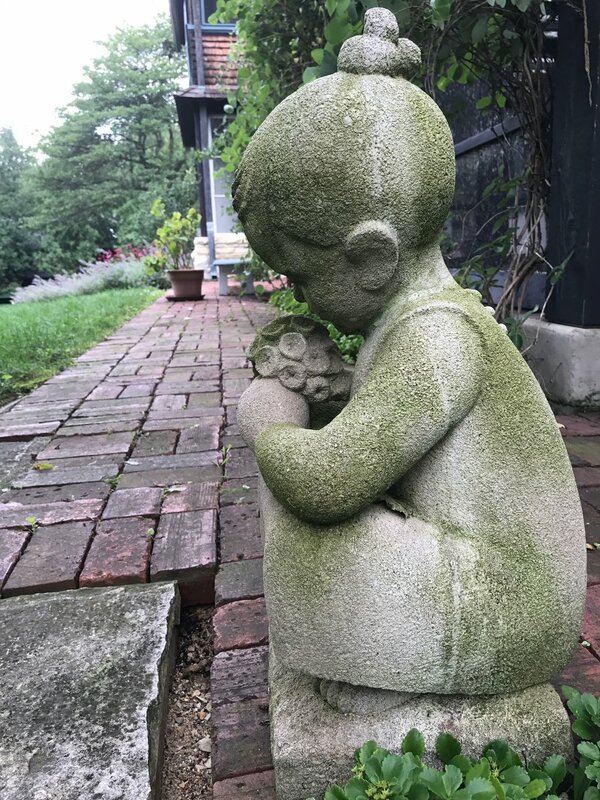 Summer, seen here at Ragdale, one of Sylvia Shaw Judson's most endearing statues. This statue reminded me of those on the front steps of my Grandmother's home. With all of her statues, she paid close attention to how the sculpture would be viewed from all angles. I see a child. Children. Beautiful human beings. Individuals I get to be with and grow with. People who teach me. I get to watch as they are discovering their worlds at the same time I am discovering mine. What a gift Syliva Shaw Judson continues to give me as I navigate my life as a mother and partner. The Quiet Eye is one I intend on honing, exploring and teaching my children. I am in pursuit of removing interpretations and detaching judgement from not only my art but from my life and the people around me, especially the young ones. I’m on that journey now and it’s freeing. Not an easy one, but putting it out for you to read helps me to stay accountable and hopeful that I can continue to move myself back to this view when I get sidetracked. I am not here to judge. I am here to create. As a human being, it’s nearly impossible to let go of interpretations; however, my Quiet Eye will continue to bring me back to simply looking and seeing- truly seeing is my intention. The Quiet Eye has a permanent home in my studio. I found this spread to be especially meaningful as a print of this image hangs in my parent's home.